Loaded With 220 Retro Video Games Including Jewel Quest, Canyon Raider, Black Jack and Basketball Pro! Soar the skies, solve puzzles, play golf or tennis, and much more! 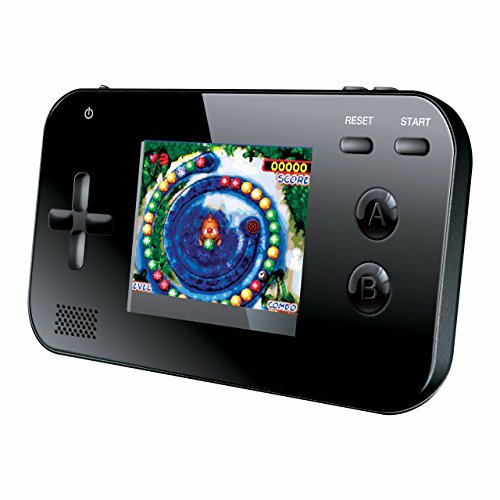 Handheld gaming system loaded with 220 fun and easy-to-play video games fits in the palm of your hand! No console required, so your entertainment goes anywhere you do. Requires 3 AAA batteries, not included. 4.75" x 2.75" x 0.5". 2.5" color display. With 220 fun and easy-to-play video games including Jewel Quest, Canyon Raider, and more! 4.75" x 2.75" x 0.5". 2.5" color display.